Until recently Foxtel and Austar have been the only mainstream ‘subscription’ pay TV options available to Australians. Fetch TV seeks to shake up this duopoly by providing subscription pay TV content delivered through broadband internet, connected to a dedicated digital video recorder that comes as part of the deal. It’s an interesting idea that has been limited until recently by being available only to ADSL customers of iiNet, Internode and Westnet. 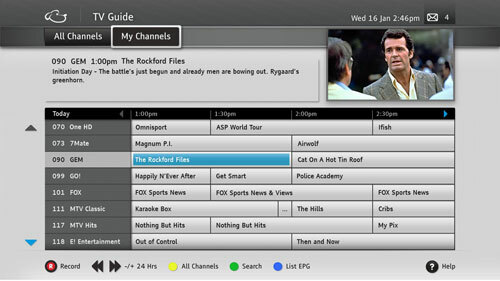 But with Adam Internet and Optus coming onboard as well in late 2011, Fetch TV will be much more widely available. I tested the Fetch TV service provided using Internode, to see how it compares with free-to-air digital TV and Foxtel. 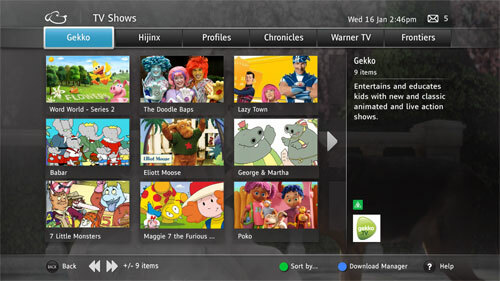 The dedicated Fetch TV PVR / Set Top Box (STB) looks a standard-enough box, with clean lines and the illuminated blue dog’s head logo of Fetch TV. You connect your TV antenna in order to access free-to-air digital TV channels but also an Ethernet cable to your modem or Ethernet switch in order to access the Video on Demand (VOD) subscription channels, various free TV shows/movies and streaming subscription channels (like Animal Planet and Al Jazeera English). This PVR can be rented as part of your package, or can bought outright for $399. That’s a pretty sweet price considering it has a 1TB drive, double the norm for PVRs around this price, plus three tuners so you can record two programs and watch a third at the same time. It’s well provisioned at the back as well, offering not only an HDMI output, but component and composite video options as well, even digital audio via an electrical SPDIF output. One caveat is that 45% of the hard drive is partitioned off for video on demand, so there’s not much more than your normal 500GB left for free-to-air recordings – still that’s enough for more than 500 hours of standard-def channels (which is most of them these days). PVR power consumption is rated at 25W, similar to a TiVo or any other PVR, so I expect it would add about $40/year to your electricity bill (if you don’t have a PVR already). All downloads used by the PVR are unmetered, which is just as well, because there will be a lot of them. That’s because Fetch continuously preloads its bundled free content, regularly downloading hours and hours of material you may never want to watch – free VOD TV, movies and pay per view content. If you’re thinking this seems an incredible waste of bandwidth (not to mention power, CO2 etc) for the ISPs involved, but the trick is the use of multicasting, a ‘one-to-many’ delivery system that serves content down a tree structure, storing copies at key nodes which are then delivered to individual users at off-peak times. Since it’s unmetered, users simply needn’t worry about – except that, just as part of your hard drive is partitioned off, Fetch TV also reserves several megabits of your broadband bandwidth specifically to use for all this downloading. In my tests, I experienced a drop in ADSL sync speed from 10.3Mbps to 7.7Mbs down, and from 1.2Mbps to 963kbps up. Internode says that customers with more than 5.5Mbps sync speed are eligible and won’t notice this loss of bandwidth for web surfing etc but I disagree. If you have an ADSL sync speed less than 10Mbps and your household uses the internet a lot, than Fetch TV may have too great an impact on other internet uses to be worth it. You will also most likely require a new modem. The way Fetch VOD is distributed over the internet means the PVR only works with modems that support that IP multicast technology. Internode has certified only four such modems (FRITZ!Box Fon WLAN 7270, FRITZ!Box Fon WLAN 7390, Billion 7800N and Billion 7800NL). I used a FRITZ!Box 7390 lent to me by Internode. What you can view using Fetch TV depends on whether you choose the ‘Full’ plan or the ‘Lite’ plan. 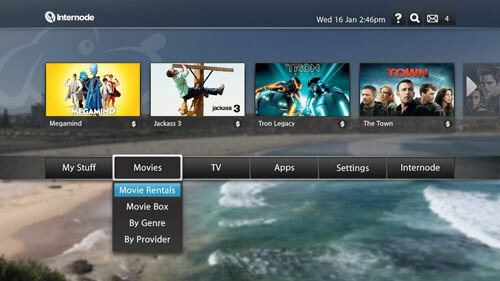 The Lite offering has free-to-air digital TV, a Fetch TV EPG over the internet, and pay-per-view movies. This is available to any Internode broadband customer. I feel the Lite service is dubious value. $5.95-$14.95 per month for a nice PVR with the main feature of being able to spend more money on pay-per-view movies. Where’s the value there, compared with online rentals like iTunes (no monthly membership fee) or even visiting one of the few remaining video rental stores in your neighbourhood? (Or being realistic, downloading via torrents?). like National Geographic and MTV, a fixed selection of 30 free VOD movies at any time, a selection of free TV shows on demand, and over a dozen music ‘genre’ stations. Subscribers to the ‘Full’ service can also purchase additional subscriptions to packages of European Football, and ‘world’ channels from China, India, etc. What are these 30 “free” VOD movies and TV? They are the kind that would be cheap weekly rentals at a video rental store – think Dirty Harry: Magnum Force. The TV shows are heavily skewed towards children’s entertainment, with a selection of dramas, docos and sci-fi as well. 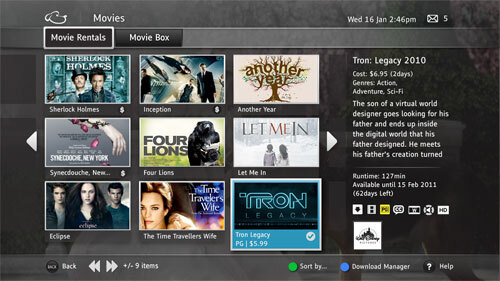 The free movies and TV shows are updated over time (seven movies per week; the PVR regularly downloads new content and deletes the old). The same free content is pushed out to everyone, so whether there’s anything you want to watch is a matter of luck. I watched free-to-air and subscription channels both live recorded and played back from the PVR hard drive. The user experience was very smooth, including an intuitive menu and easy-to-use remote. Just recently Fetch TV announced that they have added YouTube. 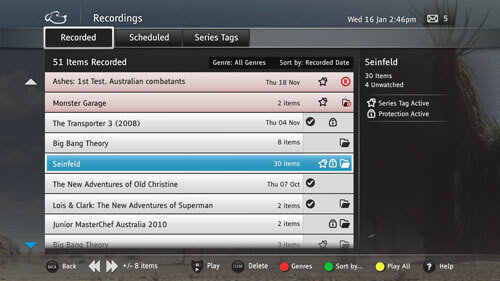 Apparently adding DLNA features and ABC iView is possible in the future. These additional features would differentiate Fetch TV a lot from Foxtel and if they don’t add to the monthly subscription fee, could be enough to tip over a lot of hesitant people into signing up. I can see why Optus decided to join as a partner which will enable it to tap into the consumer TV market, just as Telstra has done with its far inferior T-Box PVR. The ‘Full’ service should appeal more – it gives access to a good selection of subscription pay TV news, music, documentaries and specialist channels, not to mention that powerful PVR. Even if you have to pay extra for a multicast-compatible modem/router, it’s a much lower price than Foxtel’s most basic package. This article was originally published in GEARE Magazine issue #67. It is “digitally reprinted” here with permission from the editor. I have added updates where new information is relevant. I really like the idea of Fetch TV but really want sport available. I live in Melbourne and want to watch sport that isn’t AFL without forking out an extra $80 a month or whatever Foxtel charges. When fetch can offer a good sport solution I am all in!